This Florida cottage is a converted shrimp house. The decor is tropical with tile floors and ceiling fans. This 1 bedroom, 1 bathroom (shower, no tub) air conditioned cottage is well -furnished and sleeps only 2. The quaint cottage is on Cow Creek overlooking a small bay. Manatees, dolphins and many water fowl frequent the area. Enjoy your coffee from the waterfront seating area. 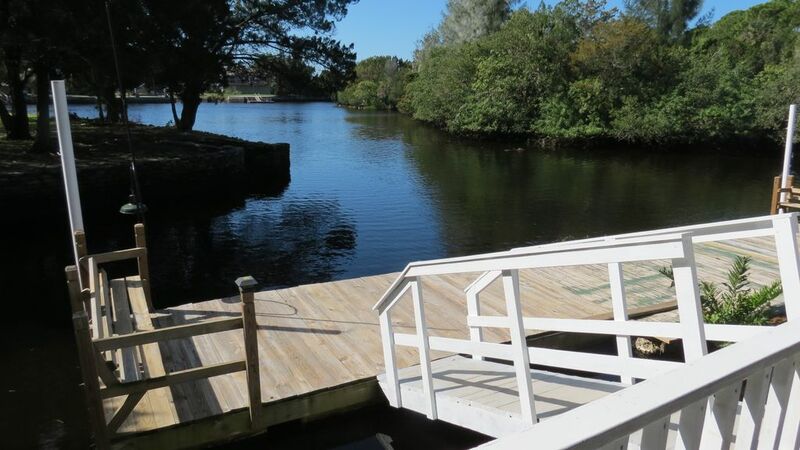 Fishing is available from the attached floating dock. Mullet, jacks, snapper sheephead are in the creek. The creek is tidal and his spring feed, and that attracts the manatees. The manatees go by the cottage daily and it is a short paddle up to the springs where they hang out. If you bring your flats boat, Red fish, snook and trout fishing areas are both north and south. Grouper, grunts, hogfish and cobia are west. The Gulf Waters of Hudson are shallow and typically offer protection from high surf conditions, making it ideal for kayaking, canoeing, and Hobie Cat Sailing. There are many artificial and natural reefs for fishing and diving off Hudson . The creek is tidal and it is to shallow at low tide to get a boat out. The boat ramp is less than a mile away and is not constrained by the tide. Users of kayaks or canoes are responsible for the safety of all those in his or her craft.Operation of the kayak or canoe is solely at the operator's own risk. Lavatory, Shower and commode. (No Tub) . Gulf of Mexico is 1/2 mile away. Cottage sets on Cow Creek with a view of a small bay. Gulf of Mexico is 1/2 mile. Kayaks and paddle boat a provided for touring the creek. Manatees frequent the creek for the fresh water at the head. 3 Kayaks and canoe provided. The location is excellent and the cottage is very comfortable. The scenic view and access to the canal is fantastic. The kayaking made available was a real treat for a couple of novices (we're hooked now). Chuck and Jarry were very kind, welcoming and gracious. Suffice it to say, we will return! A wonderful stay at a wonderful location. Thanks Chuck and Jarry!! Chuck and Jarry, as well as their cottage, made our stay very enjoyable. We spent much of the time on the porch. Chuck and Jarry helped so much by giving us restaurant suggestions. We stayed the month of February and enjoyed every minute! Chuck and Garry are very accomadating and super nice people. We loved sitting on the porch watching wildlife and listening to music. The kayaks were a bonus we saw lots of Manatees and dolphins. Location was good we were able to ride our bikes or walk to bars and restaurants. The cottage was very comfortable and everything we needed was supplied. Thanks again for the awesome experience! Peaceful and a great place to explore by water. Our hosts were wonderful. Everything was as advertised and we enjoyed our stay and will come back someday! My fiance and I spent New Years Eve at the Sea Cow cottage and absolutely loved it! Chuck and Jarry were so kind and helpful. Kayaking out to the gulf was breathtaking. Hiking at the Wichi Watchee Preserve was beautiful - old rock quarries left behind crystal blue/green water and hills to climb. The Dames and Peace caves were another great adventure - the caves seemed at least 20 degrees cooler. I think our favorite part was sitting on the porch, watching the birds and ducks at sunset and then enjoying some amazing ice cream from Hudson Beach Ice Cream Parlor. A very memorable and peaceful way to start our new year. This amazing little cottage does not get justice from the pictures. The owners are very nice and the week spent here was simple perfection. Hudson is south of Springhill and north of Port Richey and Tarpon Springs. Winn Dixie, Publix and Wal-Mart are a short drive. There are several great restaurants in Hudson and the surrounding cities. The Hudson Public boat ramp, several marinas and Hudson beach are within 1 mile. The Fisherman Shack and Cooper's bait and tackle are within walking distance. Internet, cable TV, canoe, washer and dryer are provided. Our Cottage is fully equipped for your stay. There is no need for you to bring anything unless you have something special you like to use. You are welcome to call and ask if we have something you might need.